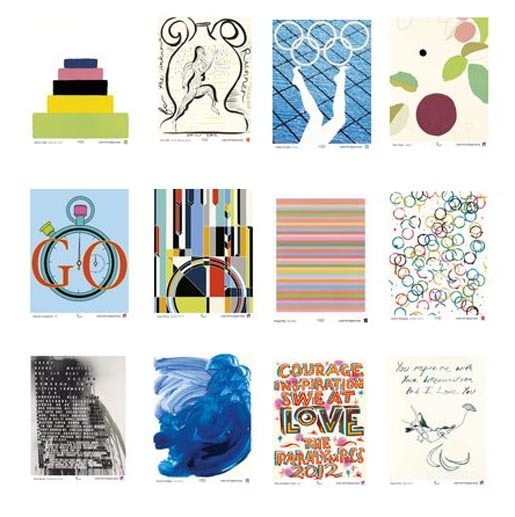 London 2012 Organising Committee (LOCOG) has released a set of twelve posters in the lead up to the London 2012 Olympic and Paralympic Games. Members of the public will be able to buy copies of the images as both posters and limited edition prints. Designed by leading British artists, the images will go on show at Tate Britain in a free exhibition as part of the London 2012 Festival in the summer of 2012. 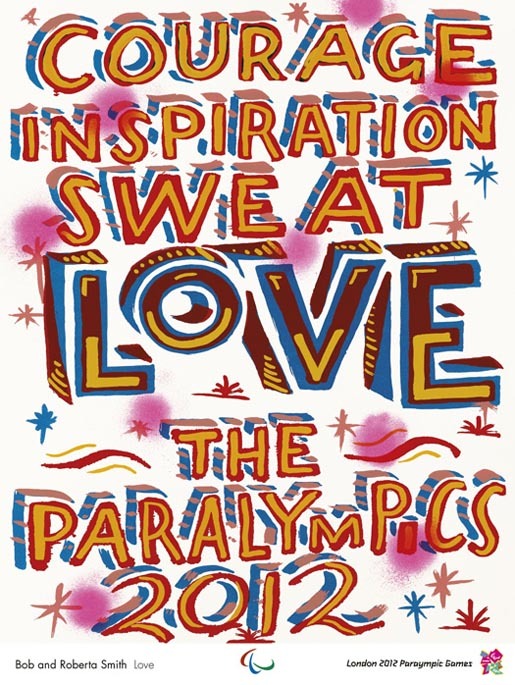 The images will also be featured as part of a high profile campaign to promote the London 2012 Games.The artists are Martin Creed, Chris Ofili, Anthea Hamilton, Gary Hume, Michael Craig-Martin, Sarah Morris, Bridget Riley, Rachel Whiteread, Fiona Banner, Howard Hodgkin, Bob and Roberta Smith, and Tracey Emin. Martin Creed – Work No. 1273. In a visually saturated world, artists can be faced with seemingly endless possibilities and choices. In response, Martin Creed imposes simple rules on his creativity. He might create a painting using only paintbrushes bought in a multi-pack, or make only one mark a day with the same felt-tip pen until the whole paper surface is covered. Repetition, stacks, and intervals are familiar motifs in his work, along with ascending and descending structures. For Work No.1273, Creed has made five single brush marks using a palette derived from the Olympic colours. The marks are arranged in an ascending form that represents an extended podium offering places beyond first, second and third. Creed’s image can be seen as expressing respect for the excellence of all competing Olympic sportsmen and women. Chris Ofili – For the Unknown Runner. Chris Ofili creates paintings inspired by personal experience, race, folklore, biblical narrative, and for the last few years the island of Trinidad where he lives. 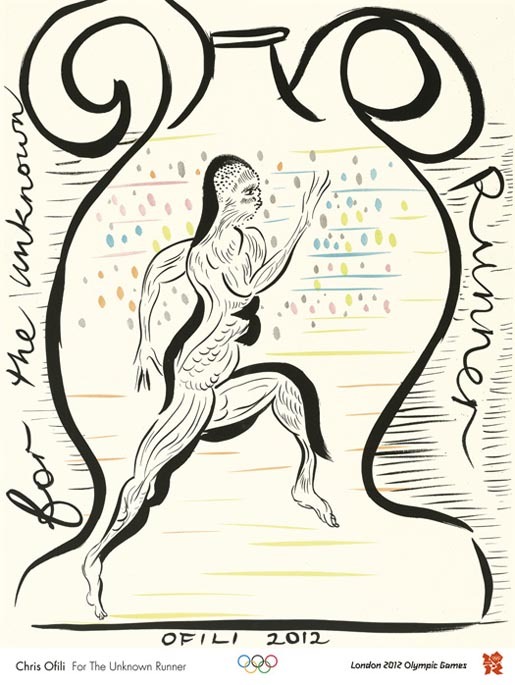 In The Unknown Runner a figure, framed by a classical Greek vase, sprints by a watching crowd (the runners on a hill that Ofili can see from his window inspired the title). The vase motif appears to reference the Ancient Olympic Games, which provided an arena for artistic and cultural expression as well as sporting excellence. Somewhere between super-athlete and mythical being, The Unknown Runner is a powerful dedication to both Olympic history and the future stars of the London 2012 Games. 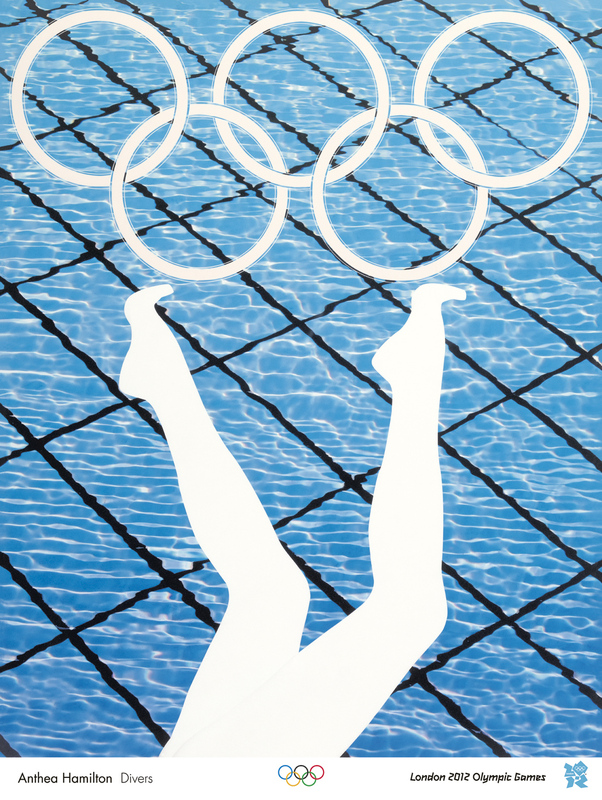 Anthea Hamilton – Divers. Anthea Hamilton creates narrative environments through sculptural assemblage and collage. Her work in part is informed by the history of physical prowess and representations of the human, especially female, body. In Divers the poised legs seem to capture a gymnastic pose or show, perhaps a synchronised swimmer diver holding a balletic position. Interestingly, the only Olympic sport exclusively contested by women is synchronised swimming. Divers evokes the engaging theatricality of synchronised swimming, perhaps the most artistically challenging sport of the London 2012 Olympic Games. 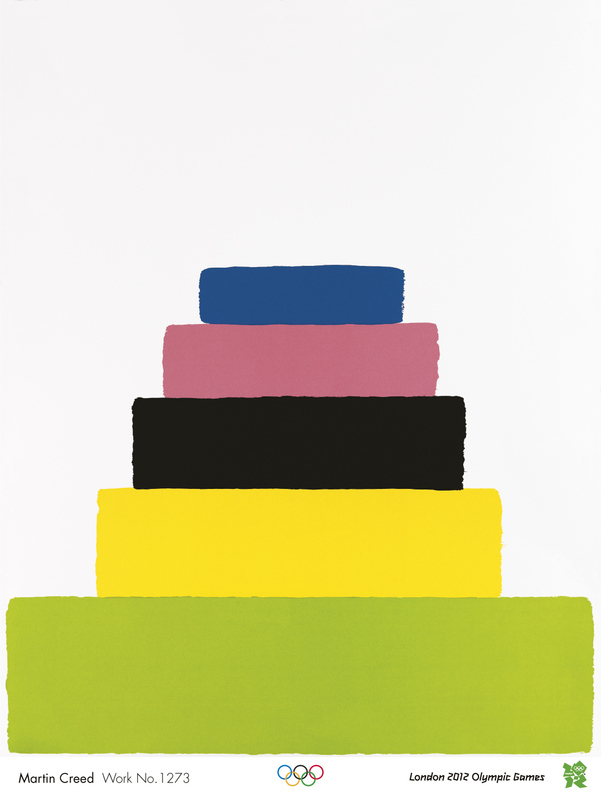 Gary Hume – Capital. Gary Hume creates paintings with distinctive colour palettes, reduced imagery, and rich surfaces. 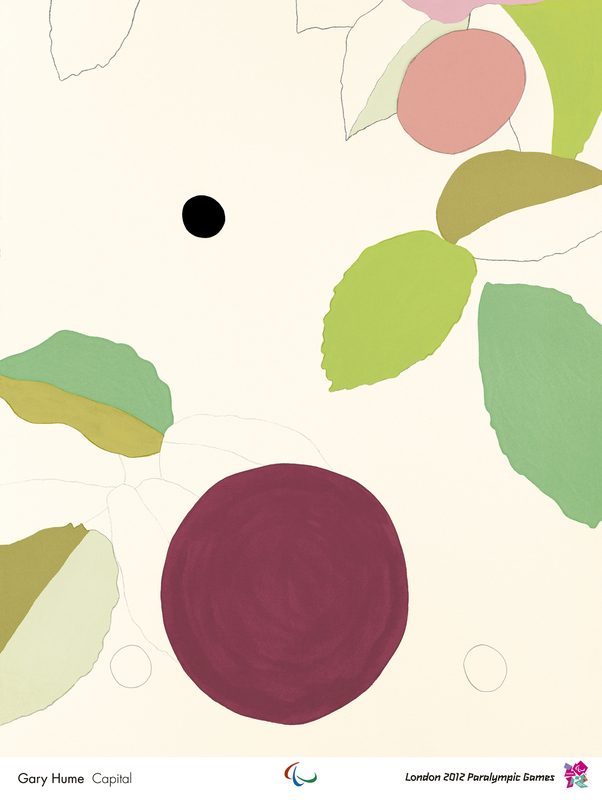 Hume has abstracted elements from an image of a wheelchair-tennis player, combining them with foliage and a soft and subtle colour palette. The large, circular form represents the wheel of the wheelchair and the black tennis ball hangs suspended in space, with the tennis racquet poised to smash the ball across the net. The large circular form can also be seen as a mouth cheering from the audience. Hume has created an aspirational image celebrating summer sport in London. 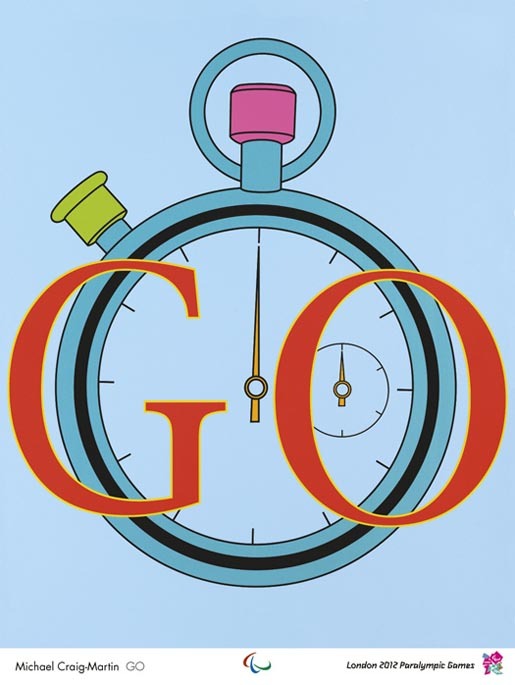 Michael Craig-Martin – GO. Michael Craig-Martin combines quotidian objects such as light bulbs, chairs, and umbrellas with everyday words. 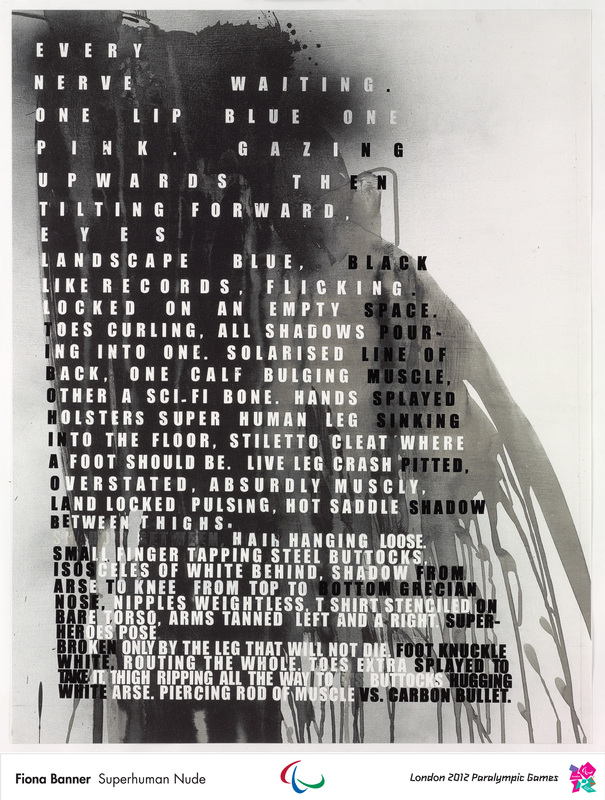 His pairing of language and image is based on both familiar and unexpected associations. In combining the word GO with a stopwatch Craig-Martin conveys with a sense of immediacy the excitement and anticipation experienced in the moments before the starter pistol is fired, and the roar of the crowd as they encourage their favourite athlete towards the finish line. 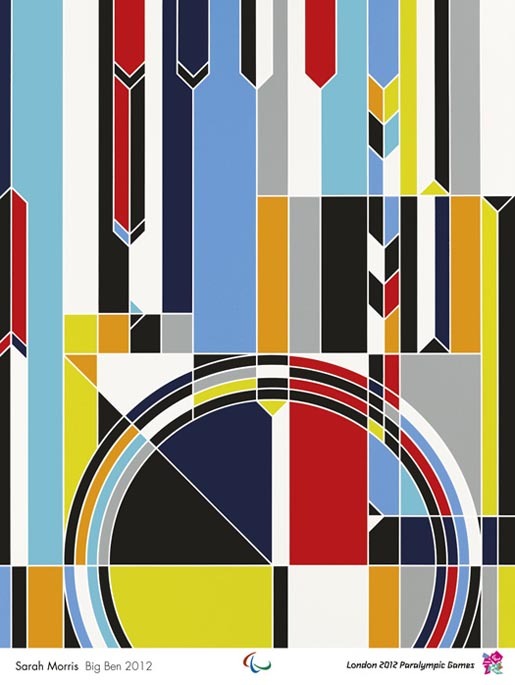 Sarah Morris – Big Ben 2012. Since the mid-1990s Sarah Morris has been creating complex, geometric, abstract paintings derived from cityscapes and architectural detail, origami patterns and signs and symbols. To celebrate the Paralympic Games coming to London Morris has created an abstract representation of one of the city’s most iconic landmarks – Big Ben. The grids and vivid colours create a sense of dynamism and also evoke images of athletic tracks, swimming lanes, and field markings. 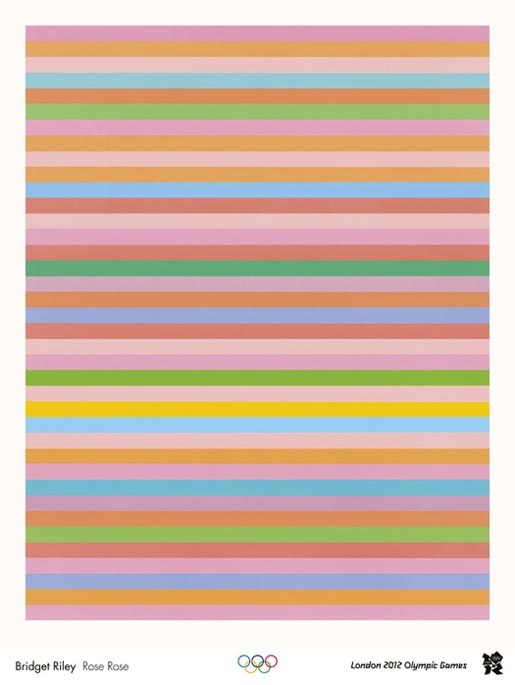 Bridget Riley – Rose Rose. Bridget Riley is one of the most original painters of our time and is celebrated for her optically vibrant paintings. By manipulating relationships between colours and shapes, she creates illusions of movement and light. For her Olympic print, Riley has arranged colours in horizontal stripes, indicating the direction of athletic tracks or swimming lanes. The relationships between the colours create a sensation of movement capturing the energy of sport and the Olympic Games. Rachel Whiteread – LOndOn 2O12. While Rachel Whiteread is best known for her sculptural work, drawing has always remained a critical part of her practice. She has described drawing as being like a diary of her work, whilst memory remains a key theme. For her print, she has composed a pattern of overlapping rings in the Olympic colours. 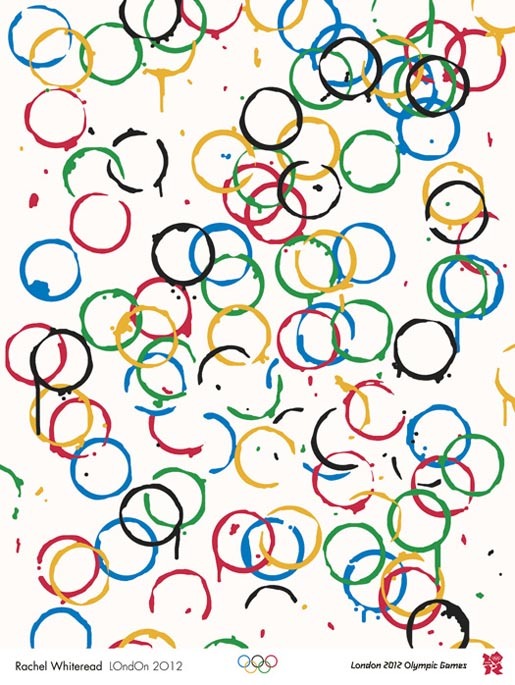 The rings explore the emblem of the Olympic Games, and also represent marks left by drinking bottles or glasses. They act as memories of a social gathering, such as the athletes in the stadium during the opening ceremony or the spectators of the Olympic Games. Howard Hodgkin – Swimming. Howard Hodgkin describes his paintings as representational pictures of emotional situations. 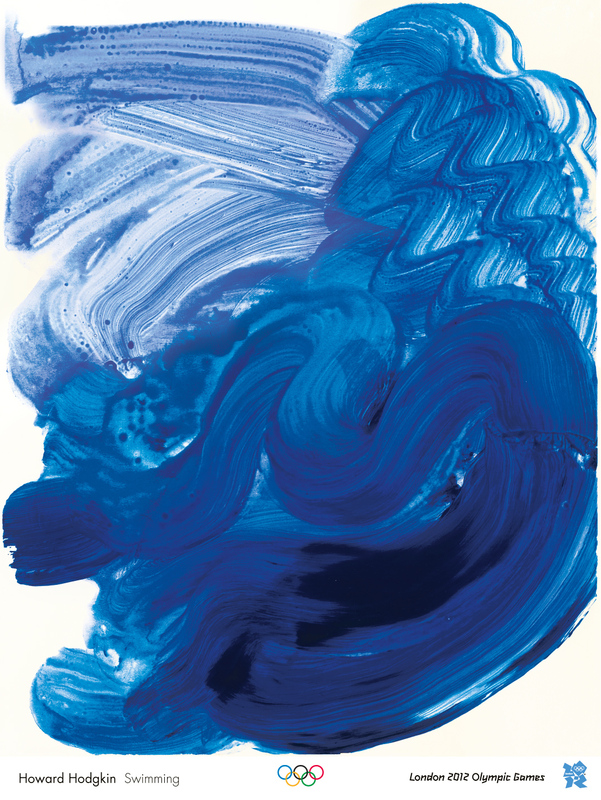 For his Olympic print Hodgkin has created Swimming – a deep, swirling mass of blue flooding across the page. In the darkest area of colour the outline of a figure can be made out as if pushing off after a tumble turn. The fluidity of the brushstrokes perfectly captures the movement of water and the sensation of swimming. Bob and Roberta Smith – LOVE in 2012. Bob and Roberta Smith use the immediacy of language to create hand-painted signs on pieces of found wood. These signs – painted in the style of community action banners, street signs, and fun fair posters – relay direct and often humorous messages. Taking the values of the Paralympic Games as a starting point, Bob and Roberta Smith propose the core elements of the athlete experience: courage, inspiration, love, and of course sweat. Tracey Emin – Birds 2012. Always at the centre of her own world, Tracey Emin shares her life, beliefs and feelings through her work with compassion and wit. Emin took the Paralympic values of Inspiration and Determination as the starting point for her print and created what she describes as a ‘love letter’. Two small birds, delicately perched on branches, appear to kiss beneath the words ‘You inspire me with Your determination And I love you’. The Agitos floats below them like feathers or leaves falling from the tree. 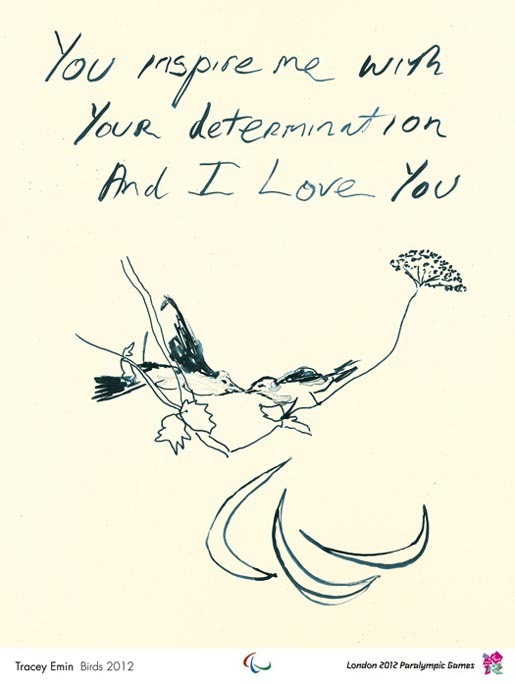 Birds have frequently appeared in Emin’s drawings to symbolise freedom and strength, whilst her use of handwritten text expresses personal thoughts and emotions.